Boasting a completely redeveloped drive, the Porsche 911 GT3 Cup will take to the starting line on the world’s race tracks from 2017. The rear of the world’s most-produced GT racing car now houses a 4-litre, six-cylinder flat engine for even more drive. Thanks to thoroughbred motorsport technology, the compact engine with direct fuel injection delivers peak performance of 357 kW (485 hp). A range of innovative details also improve efficiency in addition to engine performance, ensuring even better durability of the naturally aspirated engine in racing mode and reduced maintenance costs. A valve drive with rigidly mounted rocker arms and a central oil feed is being used for the very first time. What’s more, an integrated oil centrifuge is used to optimise oil defoaming in the engine. A crankshaft with significantly increased rigidity has also been installed. 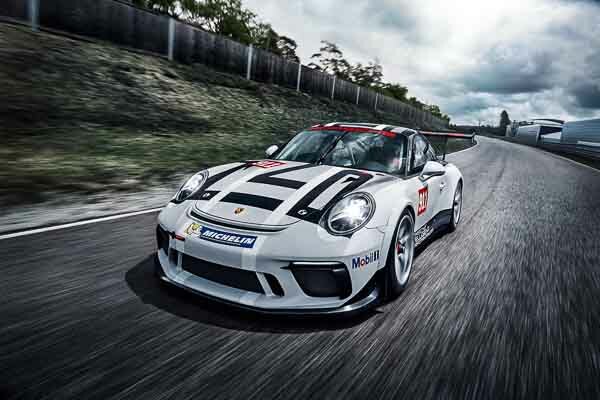 The new 911 GT3 Cup will be used in the 2017 race season, initially exclusively in the Porsche Mobil 1 Supercup, which is held alongside the Formula 1 races, and in the Porsche Carrera Cup Deutschland, as well as in North America. As of 2018, the car will also be available for the other brand cups. In total, Porsche is organising 20 of these race series for customer teams around the world, with the 911 GT3 Cup being used exclusively.